This month Google didn't release too many products and focused on improving existing ones: Google Talk has the most requested features (file transfer and voicemail), Gmail lets you delete all spam and empty the trash, AdWords shows statistics for invalid clicks. Google Video adds new features and redesigns every month hoping to keep up with YouTube's growth. Google wants to attract more developers on its side and created a repository for open-source code. But this features are small compared to what we are about to see: GDrive, Google Office, improved Google Translate, Mobile Marketplace and many others. Is this the quiet before the storm? numbers for the other services are not OK. Product of the month: Google Video. 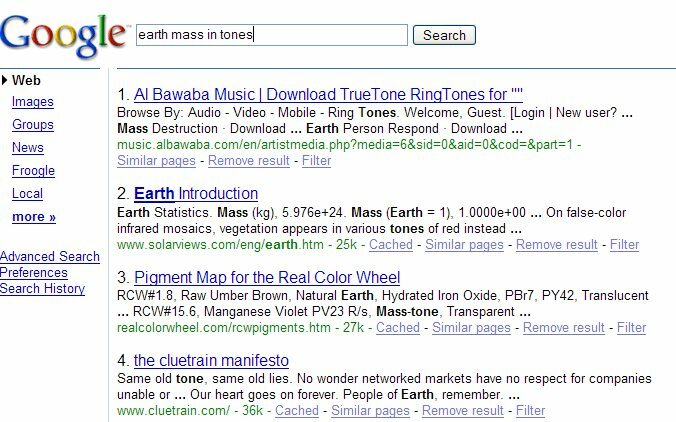 Most popular original article: If Google didn't exist. 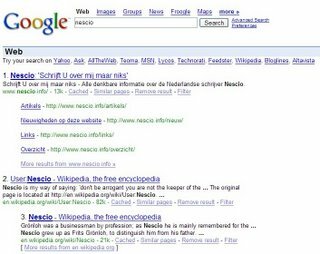 If you type a query that starts with "who is", Google will show the first words from the most relevant Wikipedia entry. Queries that start with "what is" return more elaborated definitions and are more appropriate for finding the meaning of a word. In this type of query, define is the same as what is, while info and about are the same as who is, so you can just type info oracle or about tarantino. I wrote in Google as a Command-Line that "a single search box can be more powerful than more disparate search boxes". YubNub is an online command-line that have everything a Linux junkie would want: man for each command (manual), ls (a list of all the commands), parameters, the ability to create a new command. "But what's a command? ", you'll ask me. A command can be anything: a search with Google, weather information, view source of a web page, go to an entry in the PHP manual, find who owns a domain and a lot more. into a simple command: whois google.com. It's easier to use a command like this instead of keeping bookmarks or searching using Google. Many browsers include the ability to create shortcuts for search engines, but YubNub brings this approach to a new level. You can invoke a command multiple times by typing one line. multi gim rose ginger searches Google Images for rose and ginger and shows the results in two frames so it's easy to compare them. Type guess le vieux caffe to find the language of an expression (in this case French). There is a big list of commands: here are just a few and everyone has a man entry, so you can find a description, parameters info and other details. YubNub transforms any useful service into an alias, an easy to remember command, so you can keep your old-fashioned habits on the web. May the command-line force be with you! There's a new trend at Google: let's create videos where we answer questions and upload them on Google Video. While this is a more personal approach, there must be a way to include the transcript along with the video. The text is searchable so you can find it later on and it's easier to reference it. In this video, Google's Matt Cutts explains how to create a good site that ranks well on Google. To summarize the tips: make sure the site is crawlable and it has interesting content. Mozy is a remote backup tool for Windows that gives you 2GB space to automatically synchronize your folders online. Mozy encrypts data with 448-bit Blowfish encryption, and transfers them using 128-bit SSL, so it's secure. 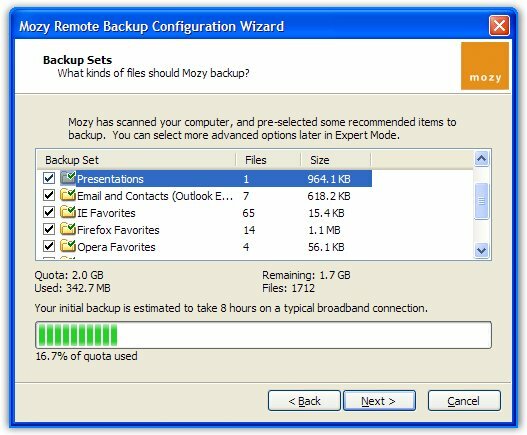 You can schedule daily or weekly backups or you can let the automatic backup happen (Mozy backups your folders only if the computer is idle for a certain number of minutes, by default - 30 minutes). If you don't have NTFS as a file system, Mozy can't perform backup for opened files, so you might consider closing all the applications while Mozy backups the files. My only complaint is about restoring files: you can select the files you want to restore online, but the interface is pretty stiff. You're limited to 5 restores a month and you get the restored files by email. It would be nice if you could manage restoring files using the same local client. Note: the offer to get a free copy of WinRAR was only available on July 30 2006. 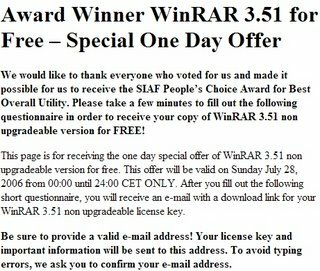 WinRAR's team was so happy that WinRAR has won the "best overall utility" award from Shareware Industry Awards Foundations, that they decided to offer non-upgradeable free licenses for WinRAR 3.51 this Sunday. The only problem is that many people want to get the free license key, so their server is very slow. If the page doesn't load, try again. You may need to reload the page 10 times or more. 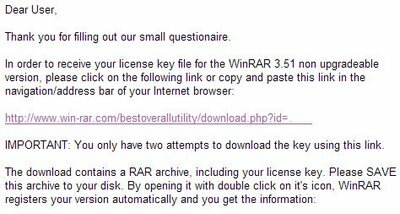 Download WinRAR 3.51 from here (1 MB), install it and then open the archive rarkey.rar that you've downloaded by clicking on the link from the mail. Now you have a great software for free. Via Slashdot, this video shows a demo of Windows Vista's improved speech recognition capabilities. As Microsoft says, "speech Recognition in Windows Vista empowers you to interact with your computer by voice. It allows you to significantly limit your use of mouse and keyboard while maintaining or increasing productivity. You can dictate documents and e-mail messages in mainstream applications, fill out forms on the web using voice commands, and seamlessly manage Windows Vista and applications by saying what you see." 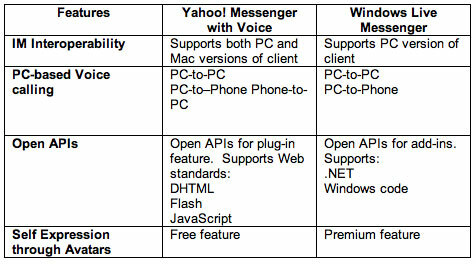 Yahoo has released a new version of its popular instant messenger, more oriented towards developers. You can find more about the new features and download the new version from my small review. Also find out how to add contacts from the MSN network and chat with them (the voice feature is not available). In case you don't like the Flash ad from the main window, read my updated post about removing the ad. Google Talk wouldn't show anything and let the future (features) decide what application is the best. The latest version of Google Toolbar for IE has a strange new feature: keep Google as the default search engine. There's an exe that runs by default at the startup and monitors if another software (like MSN Toolbar) tries to change Google's settings. 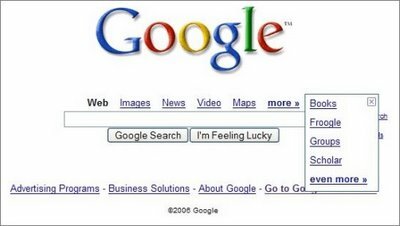 GoogleToolbarNotifier is a companion to the Google Toolbar. This executable is necessary to enable the Search Settings Notifier feature of the Toolbar. This feature lets you keep Google as your default search engine and prevents this setting (and others as we add new features) from being changed without your consent. To enable or disable this feature, please click the "Settings" button on your Toolbar and choose "Options." In the "More" section, check or un-check the box next to "Search with Google." As long as this feature remains enabled, GoogleToolbarNotifier.exe will run silently in the background. This is most likely a reaction to Microsoft's intention to set MSN as the default search engine in IE7 and to other toolbars (Yahoo Toolbar, Windows Live Toolbar) that change IE's search engine by default. Winamp has a similar software that monitors if other players try to change its file associations. The setting can be changed by the user. Update: Even if you disable "Search with Google" from the toolbar, and kill GoogleToolbarNotifier.exe, everytime you load IE, Google Toolbar launches GoogleToolbarNotifier.exe once again. The only way to get rid of the notifier is to delete the folder C:\Program Files\Google\GoogleToolbarNotifier. I think Google has started to become a little evil. The description above clearly states that the exe will run "as long as this feature remains enabled". Update 2: Benjamin Lewis from Google says it's a bug. "The fact that GoogleToolbarNotifier.exe remains in memory after disabling the feature is a bug – thank you for reporting it. We're working on it right now and should have it fixed shortly. As long as the feature is disabled the .exe doesn’t actually do anything, it just remains in memory (not that this makes it less of a problem)." Update 3: The bug has been removed. Google Toolbar 4 for Internet Explorer is out of beta. The most interesting features of this release are: custom buttons (a better version of Firefox's live bookmarks), integration of Google Bookmarks and a better search box that includes spelling corrections, suggestions and queries history. 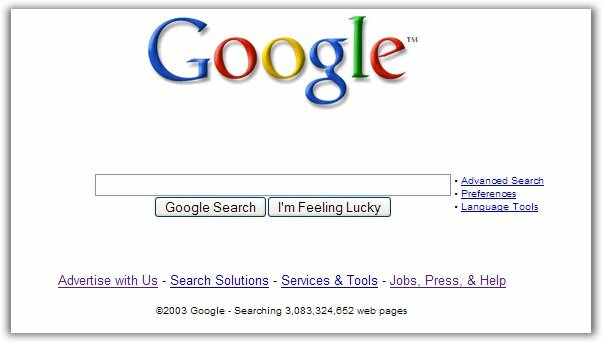 After downloading the toolbar, you can add Google Operating System as a custom button so you can easily find the latest posts and search the archive for older posts. Other custom buttons can be found in the gallery, including buttons for Gmail, weather, Slashdot and other search engines. 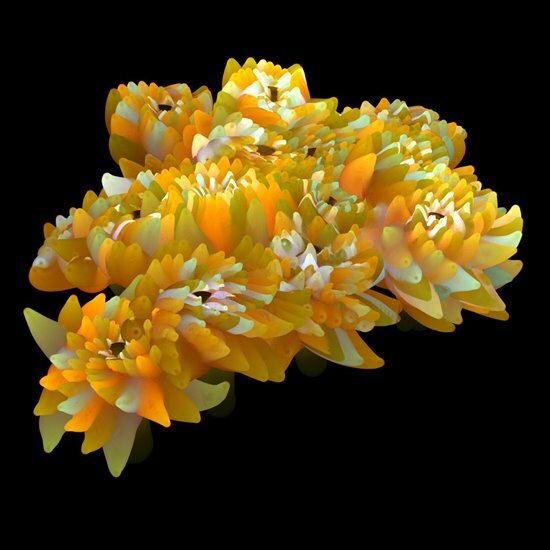 While most people think spam is something unpleasant, Alex Dragulescu, a visual artist (he studied film, photography, art history, computer animation and programming) uses the characters found in spam messages to create virtual spam plants. CNet explains how he created this form of art: "For the Spam Plants, he parsed the data within junk e-mail--including subject lines, headers and footers--to detect relationships between that data. Then he visually represents those relationships. For example, the program draws on the numeric address of an e-mail sender and matches those numbers to a color chart, from 0 to 225. It needs three numbers to define a color, such as teal, so the program breaks down the IP address to three numbers so it can determine the color of the plant. The time a message is sent also plays a role. If it's sent in the early morning, the plant is smaller, or the time might stunt the plant's ability to grow, Dragulescu said. The size of the message might determine how bushy the plant is. Certain keywords, such as Nigerian might trigger more branches." Alex Dragulescu has many projects connected to the Internet: spam architecture (that translates "various patterns, keywords and rhythms found in the text into three-dimensional modeling gestures"), blogbot ("a software agent in development that generates experimental graphic novels based on text harvested from web blogs"), algorithms of the absurd ("heap sort algorithm as a hidden structure and illustration of the desire for efficiency and the modes of production of the capitalist system"). It's really interesting to see how close art and technology can be and how easy is to transform ugliness into something beautiful and revealing. "Spam is a random piece of literature, it has unseen effects, it changes all the time. And it's led me to see text differently," says Alex Dragulescu. Tony Ruscoe found some new Google services while trying to log in to sandbox.google.com. It seems that Sandbox accounts are another kind of Google Accounts, used by those who test new Google services. Tony explains how to create a Sandbox account, although you can't actually test the products. Examples of events already hosted are: Doodle 4 Google, ACM World Finals. Google Online Assessment - http://www.google.com/goaexam - an online skill assessment tool? An interesting article that explains the term gives some hints: "For example, consumers can design their own clothes and accessories (including jewelry) online. Soon, they'll be able to virtually try on clothes or rings and e-mail the images to family, friends, and strangers for feedback before deciding whether to buy." You can create a Sandbox account at: https://sandbox.google.com/accounts/NewAccount. To see the names of the services and add them to your account, you can go to these links: ev, guess, goa, re, rs2, mmp, wf that follow this pattern: https://sandbox.google.com/accounts/Login?service=[code] and click "Continue" for each one. Then if you go to My Account, you'll see a list similar to the one in the screenshot. You can use this new Google Account only if you log in at sandbox.google.com. Of course you can't log in to the services you've just added. Only Google testers can do that. But it's interesting to see what the future may bring. Update: Google fixed this, so you can't perform the actions described in this post anymore. I placed an order with Buy.com on July 7, 2006. No problem, very slick. I received an e-mail from both Google and Buy.com thanking me for my order. Days came and went, and I kept checking the status of the order and always it said “In progress”. It was an in-stock item as far as I know, and Buy.com has always been very prompt in my experiences with them, so this was strange. So finally, on July 11th I sent an e-mail using the send message to seller wizard in Google Checkout. No response. Not even an automated reply. ... and got a lot of presents from Google (USB sticks, mouse, pens and many other promotional materials). there's frustration about the delays due to the order review process. at filtering out the bad guys. Send files and folders to your friends. There is no restriction on the file type or size. You can send files using drag and drop in a chat window or by clicking on "Send files". If you share a photo, Google Talk will show a thumbnail so you know how it will look while chatting about it. You can also share folders. You can think of voicemail as an offline message. If a friend can't answer the call, you can still leave him a message of up to 10 minutes. Or you can directly send a voicemail if you feel it's more appropriate. You can search all the voicemails in Gmail by adding label:voicemail to the query. Show your contacts what music are you listening. It works with Winamp, Windows Media Player, iTunes and Yahoo Music Engine. You need to download Google Talk from this testing location, as the new version (Google Talk 1.0.0.95) hasn't yet been released. 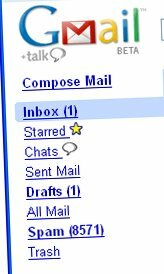 Download Google Talk 1.0.0.96 from Google Talk's site. "The goal of hosting on Google Code is to promote healthy open source development by offering hosted tools that most open source projects can't afford." This is the reason why Google chose to offer this service only for open-source projects. An example of project is Chris DiBona's Goopy, a Python library that brings functional programming aspects to Python. You can find many other open-source code from Google on the site. There's also a demo that shows most of the features of the service. Google Project Hosting doesn't have all the features of SourceForge (no webpage hosting, no download feature), so many developers will use both sites. Each project has 100 MB quota and has to store some metadata (description, tags, links). It's easy to add issues and to search for them using advanced criteria (status, priority, label) - that's one of the strongest points of the service. The code management can be done with Subversion, a version control system similar to CVS. Greg Stein says, "We really like SourceForge, and we don't want to hurt SourceForge" or take away projects. Instead, Stein says that the goal is to see what Google can do with the Google infrastructure, to provide an alternative for open source projects. Chris DiBona says that it's a "direct result of Greg concentrating on what open source projects need. Most bugtrackers are informed by what corporations" and large projects need, whereas Google's offering is just about what open source developers need. DiBona and Stein describe the project as ideal for smaller open source projects, rather than larger projects with more complex needs, such as Apache or GNOME. However, they also say that larger projects are welcome. Do you see a trend here? They are just some domains, but because Google bought so many variations on the same theme, one can infer that Google prepares for a hosted service for businesses. Think Office Live. Microsoft Office Live provides companies with its a free domain name, Web site, and e-mail accounts. * Web site managed and maintained by Microsoft where you can work together and share information with employees, customers, suppliers, and contractors. Google could develop a business version of Writely, Google Spreadsheets, integrate them with Gmail for Domains, Google Calendar and a corporate Google Pages. Google could also offer some discount for an enterprise search solution like Google Mini and some discount for AdWords / Google Checkout. Google could offer basic hosting free, but advertising-supported, and advanced version, at a competitive price. Sebastian Moser is a young Austrian software engineer that is especially interested in what's going on behind the scenes at Google and other web companies. This month, Google joined the ODF Alliance, which led to speculations about what they want to achieve with this step. It is logical that they will support the OpenDocument file formats in their products through importing & exporting (Writely, Google Spreadsheets) and previewing them in Gmail. But Google's support could go further and could, in fact, solve the main problem that hinders the OpenDocument format from spreading widely: the distribution. As long as ODF files can't be opened on most computers, there won't be a big market for it, and OpenOffice.org/StarOffice customers will continue to export all their files to *.doc. This is where Google could step in. Their toolbar, which is available for both Internet Explorer and Mozilla Firefox, has a very big user base and a market share in the toolbar-space of almost 50%. Google could use the toolbar to deliver an ODF-plug-in for Microsoft Word, which installs silently in the background and gives users the ability to open and save ODF-files in Microsoft Office without thinking about the format. Toolbar installations: The ODF-support could be another killer-feature for their toolbar, leading to more and more people installing the toolbar, which is responsible for a large amount of Google's revenues. Smoothing the way for Google's own products: An open file format doesn't only help alternative Office applications, but also Google's own business. Although Microsoft's Open XML is fully documented, Google should and could never trust a company that has control over a file format and is at the same time one of the biggest competitors. So, having a wide-spread, real open file format could make it much easier for Google to create a widely-used Web Office. Beating Microsoft: The struggle between Google and Microsoft has long become to a personal game between Eric Schmidt and Steve Ballmer, with Google currently being more successful than Microsoft. We'll see what will come out in the end, probably I'm completely wrong. But anyway, let me know what you think about it. Virender Ajmani has created a mashup between Google Maps, Youtube videos and pictures of the 99 women from AskMen's Top 99 Women 2006. Beauty is subjective, so I'll let you decide if the top is fair, or if it's just the result of media exposure. In the screenshot, Natalie Portman - ranked number 9. 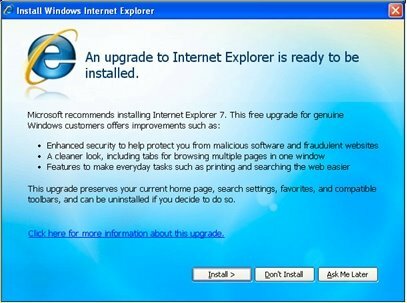 IEBlog informs that Internet Explorer will be distributed as a high-priority update via Automatic Updates "shortly after the final version is released for Windows XP, planned for the fourth quarter of this year". Internet Explorer 7 has Windows Genuine Advantage built-in so it won't install if the license of Windows XP is not valid (and sometimes even if it is). Although Microsoft will notify users about the new version of IE, most will probably just press "Install", so at the end of the year IE7's market share will be higher that IE6's share. This will be a problem for many companies whose sites will suddenly stop working: many webmasters don't test the sites in IE7 and the customers will upgrade from IE6 to IE7. Microsoft will also release a IE7-blocker for corporate users that don't want to install the new version of IE. Most businesses will just sit and wait a couple of months to see if the new browsers has security problems or other major flaws. I don't recommend to have Automatic Updates activated because Microsoft uses this feature to install all kinds of software, including the spyware Windows Genuine Advantage. Webzari is a way to see the most important web pages that link to a site and the most important pages from a site. Webzari has been created by Yahoo Korea and it's a visual version of Yahoo's Site Explorer. The Flash represents each page as a planet: the bigger is the planet, the more important is the page. The yellow planets are sites from Korea, the purple planets are international. If you click on a planet, you can either visit the site or focus on that site. It's important to note that the data is not very accurate: I couldn't find many important sites in Yahoo's list of backlinks, but you can discover many interesting sites along the way. Webzari has loud sounds. If you want to mute them and other Flash content, you can use Flash Mute. Language is not a barrier to use the site. David Bloom found some interesting pages on Google's servers. You can compare them to archive.org's version. 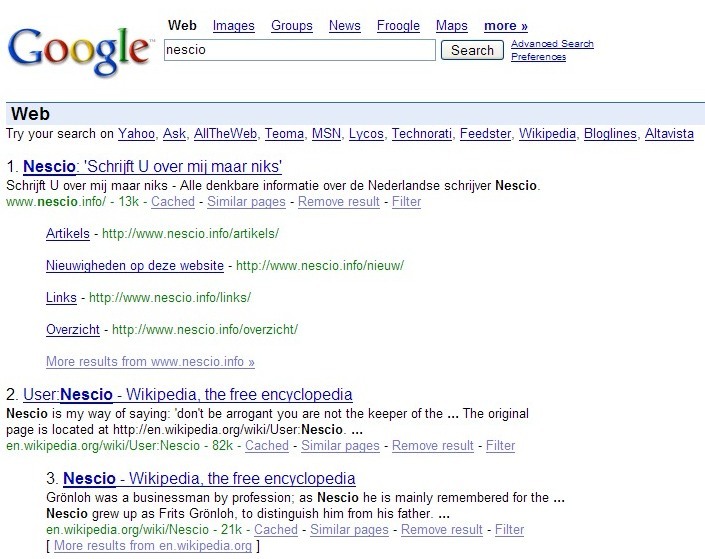 ...will take you to an old Google homepage (copyright 2003). ...will take you to an even older homepage (copyright 2001). 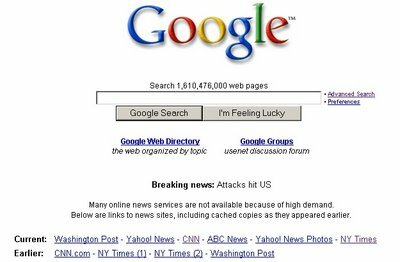 The page from 2003 doesn't have any link to other Google services like Image Search or Groups, so it's not the actual Google homepage from that time. 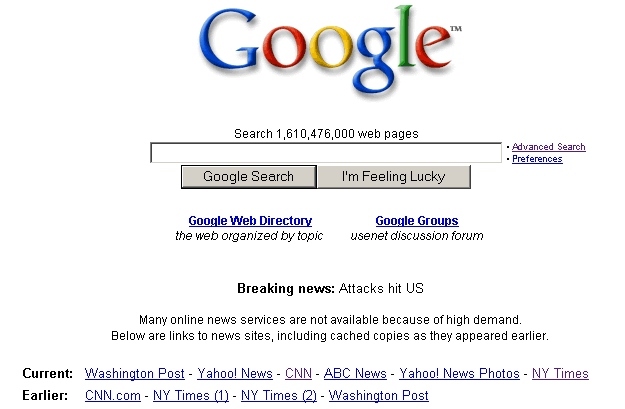 The page from 2001 is Google's homepage. Update: Google fixed this and no link seems to work anymore. * make any window "always on top"
For example, you can right-click on the maximize button in the right-top corner of the window to transform a window into a floating icon. The icon occupies little space and it's always available. If you right-click on the floating icon, you can preview the window and restore it. Similarly, if you right-click on the close button, the window disappears completely. You can restore it from the Windows Manager section of DM2. The application doesn't have an installer, so you can extract the files into a folder or copy them to your USB drive. Another impressive thing: the ZIP archive has only 135 KB. DM2 is open-source and it's free for noncommercial use. Update: if you can't find the download link, here it is. Visit more often SourceForge and it won't seem that difficult to find your way. Writely's transition to Google's servers takes longer than expected, if we consider that the company was acquired in March. Writely team has announced they've started to send another batch of invitations to those who have submitted their emails. "If all goes well, we should have everyone in before summer ends." If you don't want to wait until Writely sends the invitation, there are sites that promise to give you one. It's interesting to note that the famous file that included the list of features of GDrive was found on writely.com. Is that a sign that Writely will be a part of the GDrive project, along with Google Spreadsheets? Check Also apply filter to * conversations below. All the spam messages will be moved to trash, where you can check for false positives. Alternatively, you could set the filter to mark the messages as read instead of deleting them. 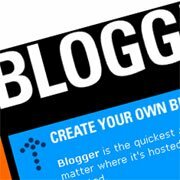 After a lot of pressure from advertisers and media, after a blogger from ZDNet has spread the idea that Google lets click fraud happen, after the release of many researches that show click fraud rate is increasing, after many lawsuits and settlements, Google started to become more transparent. Anomaly-based (or Deviation-from-the-norm-based). According to this approach, one may not know what invalid clicks are. However, one can know what constitutes "normal" clicking activities, assuming that abnormal activities are relatively infrequent and do not distort the statistics of the normal activities. Then invalid clicks are those that significantly deviate (mainly in the statistical sense) from the established norms. For example, if a normal average clicking frequency on an ad is 4 clicks per week and if someone clicks on it 100 times per week, then this is an abnormally large clicking activity. Rule-based. Each rule has one or several conditions in its antecedent and is of the form "IF Condition1 AND Condition2 AND … AND ConditionK hold THEN Click X is Invalid (or respectively Valid)." 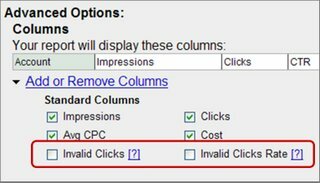 An example of such a rule is "IF Doubleclick occurred THEN the second click is Invalid." Classifier-based. A click is invalid if a data mining classifier labels it as "invalid." This labeling is done based on the past data about valid and invalid clicking activities used for "training" the classifier to decide which clicks are (in)valid. Google has built the following four "lines of defense" against invalid clicks: pre-filtering, online filtering, automated offline detection and manual offline detection, in that order. Google deploys different detection methods in each of these stages: the rule-based and anomaly-based approaches in the pre-filtering and the filtering stages, the combination of all the three approaches in the automated offline detection stage, and the anomaly-based approach in the offline manual inspection stage. The reports also shows that it's hard to define invalid clicks and to establish rules that precisely delimit them, but Google is constantly improving their detection system. Another proof of transparency is a new feature of AdWords: advertisers can now see the number of invalid clicks found by Google. 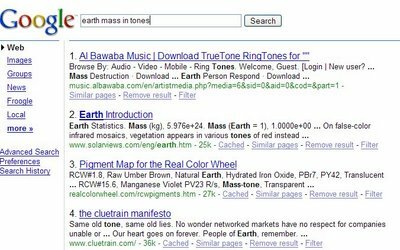 Advertisers are not charged for the invalid clicks and they can only see aggregate information about these clicks. Google doesn't disclose information about the IPs of the invalid clicks or the reason why they are invalid. "The metrics of invalid clicks and invalid clicks rate will show virtually all the invalid clicks affecting an account. These clicks are filtered in real-time by our systems before advertisers are charged for them. The resulting data will of course differ from one advertiser to the next," says Shuman Ghosemajumder, Business Product Manager for Trust & Safety at Google. This timeline is similar to a Google Map: it imports data from an XML file, so it's easy to visualize temporal information, like the evolution of a company, a person or an event. There is also a step-by-step guide that helps you create a timeline. The widget was created by Simile (Semantic Interoperability of Metadata and Information in unLike Environments), a group that develops open source tools related to Semantic Web. You can find other interesting tools at their website. I propose a little experiment. Log off your Google Account and try to imagine you're a different person. You're a friend who found the password by accident. Then log on the same Google Account and try to find interesting information about you in your Gmail, Search history, Google Calendar, Google Reader and other services. You could use this page for reference. Try not to think about what you know is there. How would you describe yourself by looking only at the data? Can you find anything that would embarrass you if it were public? 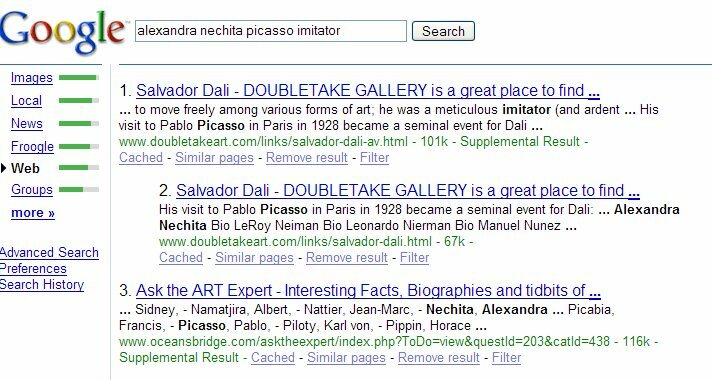 If you Google yourself, most of the data you find in the search results is hard (if not impossible) to destroy. If you search your private data, anything can be deleted. Would you delete anything if you knew someone would break into your account? OSCON is O'Reilly Open Source Convention, an annual conference on open source software, such as Linux, Apache, MySQL, Perl, PHP and Python. Greg Stein has worked for many open source projects like WebDAV, Python and Apache and now works for Google. It will be interesting to see the new Google project that might be a search engine for code like Krugle, a repository for open source code that allows collaboration and has a version control system or an API based on GData that expands Google Web Search API. Or it might be something else. Google has contributed a lot to the open source community by releasing patches to WINE, to the Linux kernel and by developing APIs for many services. One thing will definitely remain proprietary code: Google search engine. According to Reuters, Google Maps for mobile phones will include starting today live information about the traffic for 30 major metropolitan areas in the US. You just have to select your destination, and Google Maps will show the route with color flags for different conditions of the traffic (red, yellow and green). Google Maps for Mobile can be accessed at http://google.com/gmm on your Java-enabled mobile phone. After downloading the software, go to the desired location within the application and select "show traffic" in the menu. You can also check the demo. Another new feature is that you can store your favorite locations, so you can access faster frequently used routes. 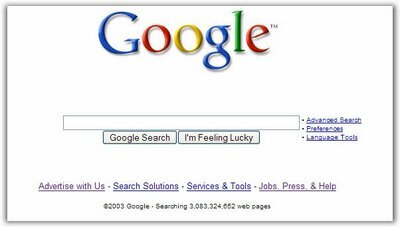 Explore Google World from 2003. "Work is hard and you need a break. A sun-soaked vacation is just the ticket, but where to begin? With Google there's a world of helpful, time-saving features right at your fingertips." How to build a better query - useful tips. A Java applet that shows a heart and writes "I love you" in more languages. That was before designing logos for holidays and special events. 20 years of Usenet - including first mentions of Microsoft, Sun, Cisco, Madonna, Britney Spears, Mac OSX and Google. Statistics about html elements' usage. An average web page uses 19 tags. 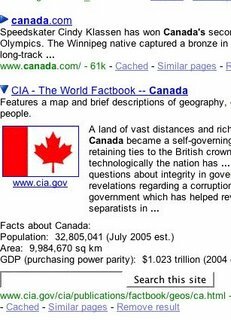 In 2003 Google searched 3 billion documents. 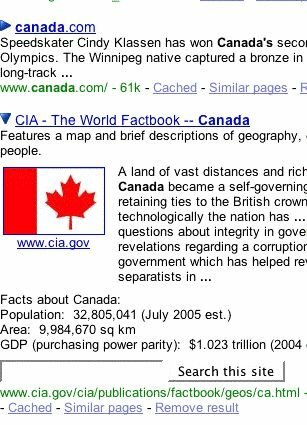 Now Google has more than 24 billion documents in the index. Also see why size isn't important. Google ranks #1 in NPD search & portal scorecard measuring loyalty and satisfaction (in 2000). 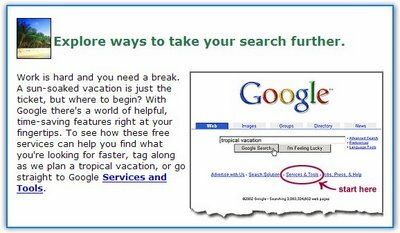 Google Voice Search - search on Google by voice with a simple telephone call. Google Keyboard Shortcuts - navigate search results without using your mouse. Google Compute - put your computer to work advancing scientific knowledge when it's not helping you. 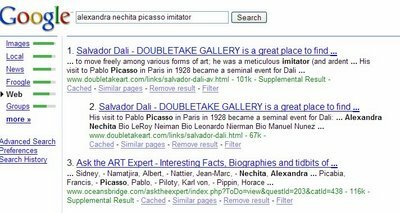 Site-flavored search - Enter the URL of a site, and Google will try to infer a profile for the site based on its content. AdSense for Paper - Google has placed targeted ads in two magazines on behalf of AdWords advertisers. Dilbert and the Google Doodle. The first and last Dilbert cartoon on Google. Britney Spears spelling corrections. The data shows some of the misspellings detected by Google's spelling correction system for the query [ britney spears ], and how many different users spelled her name that way. The most common misspelling is "brittany spears". Google searches related to 9/11. Also Google's condolences. Google can help your business make more money: promo for AdSense, AdWords and Froogle. AdWords 2004 - a presentation about AdWords with nice greyscale pictures from Googleplex. Librarian Center - a newsletter with search tips for librarians. This page used to be displayed when searching for "jew" because the first results were anti-jew sites and people were disturbed. Looking for Picasa? What about Urchin? Credits for some of the links: Neil Patel and Cristian Mezei. 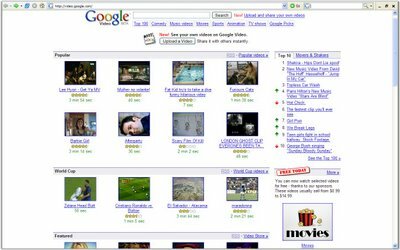 Another design experiment for Google homepage includes a link to Google Video, and removes the links to Google Groups and Froogle. If you click on "more", a new layer shows links to Books, Froogle, Groups and Google Scholar. 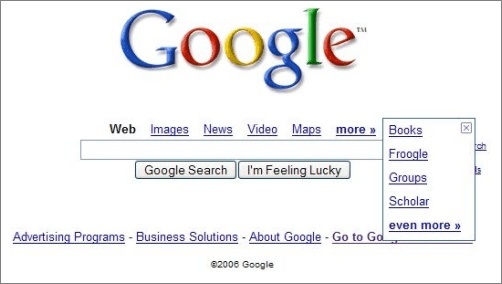 This is one of the the many UI experiments made by Google in the last year. You can see a selection of the most interesting designs that were visible for a very small part of the Google users (the small descriptions are mine).